As a small and humble organization, our gratitude reaches beyond the stars everytime you make a dream come true. Our quest for solar started a year ago when our small group visited a farm in Carver, Minnesota that was fully operated by this renewable energy. This experience gave us the hope and inspiration to make this possible. In June, we discussed this opportunity at our strategic plan meeting to determine the feasibility. After agreeing to move forward with this project, the fundraising plans began. In October, a fundraiser in New York City raised over $5,200 for this initiative. And as of January 26, 2019, solar power electrifies our center. 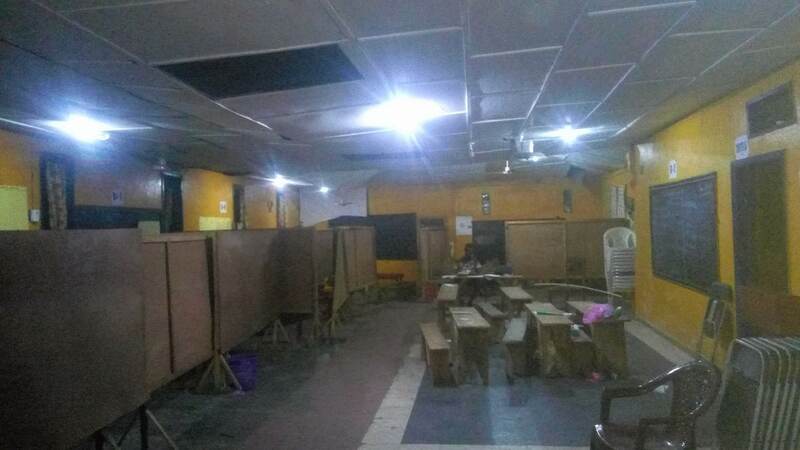 The first phase of our solar initiative provides 24/7 lights, runs ceiling fans for cooling in our classrooms, and supports our business office during the day. A total cost of $6,000 (includes general funds) purchased all the materials for phase 1. 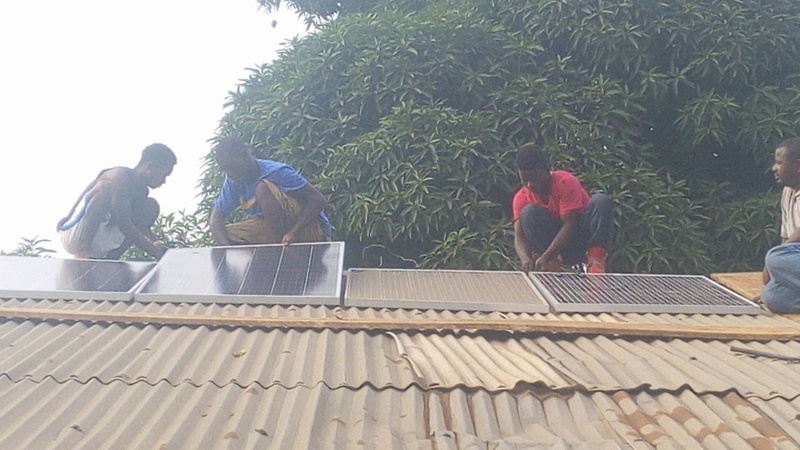 As a learning opportunity, the vendor Taleance T Tokpah (the owner of T & T Solar Tech) worked with our electrician students to install the solar. Taleance T Tokpah standing in the center by the table instructs our students on how to test the panels. Before we can implement phase 2, our diesel generator will be used for our computer training course three times a week. In the near future, we will discuss the next steps to cover all our center’s power needs on solar. In the meantime, please enjoy the photos of our students learning something new. 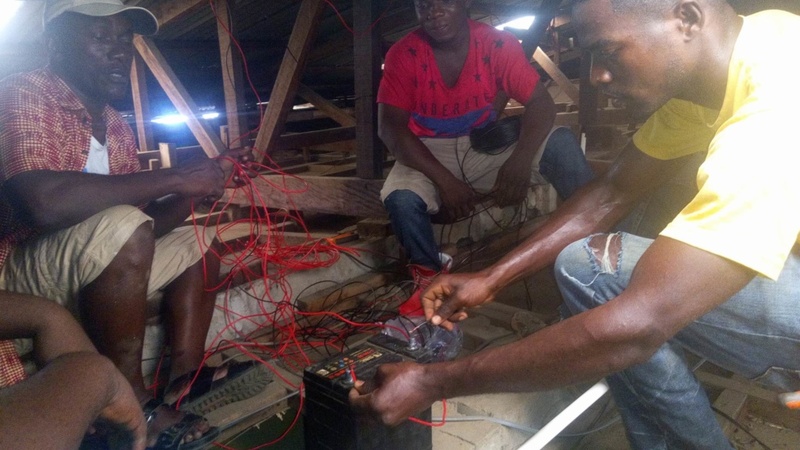 You empowered our electrician students (blue and red shirts) to help install our solar panels with our vendor and technician, Taleance T Tokpah. Your electrician students working together to install solar panels under the guidance of Taleance T Tokpah. 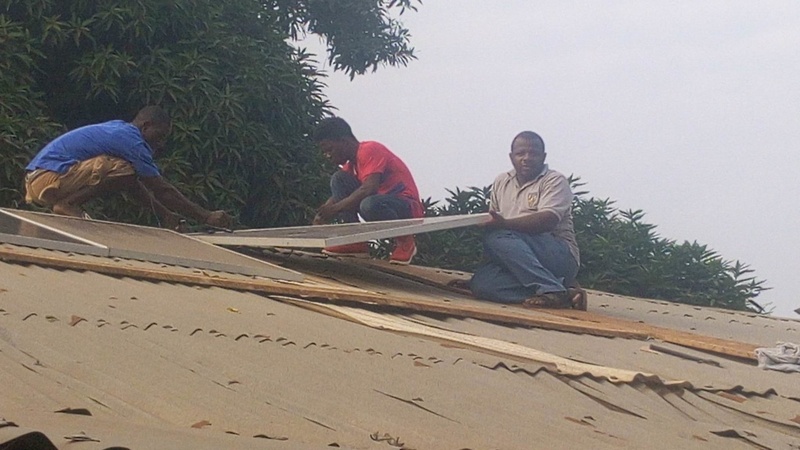 Your students and Kelvin Fomba (UDS Co-Founder & Director) testing the connections between the roof and ceiling. Your student preparing the wire to connect the panels to the control box. 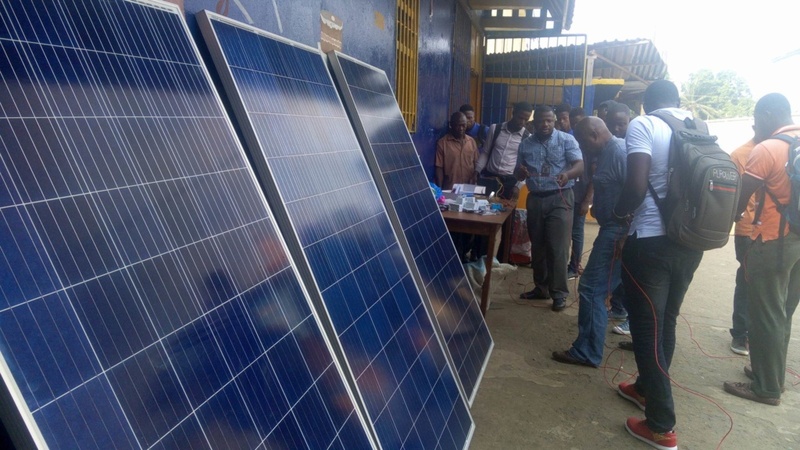 UDS Training Center now powered by solar. Thank you so much to our generous supporters in New York City! You gave our students reliable and stable electricity at our center. What remarkable gift! Also, our sincere thanks to Taleance T Tokpah for sharing his knowledge and expertise with our students! 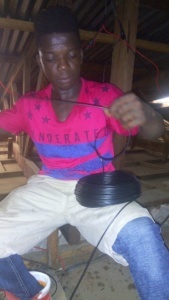 This entry was posted in Africa, Electrician Course, Liberia, NGO, Real Experience, Skills training, Solar Panels, Solar Power, Sustainable Training, Thank You, Trade School, Uniting Distant Stars, vocational training, youth development, Youth Empowerment and tagged Africa, Electrician Course, Liberia, NGO, Skills Training, Solar Energy, Solar Panels, Solar Power, Thank You, trade school, Uniting Distant Stars, Vocational Training, Youth Development, Youth Empowerment. Bookmark the permalink. Thanks for this moving forward. I work with health NGO and really need to operate at solar level. Please send me information on how I can learn and use on our clinic network.